The brutish killing of a football fan, Kolade Johnson, last Sunday in Lagos by trigger-happy policemen attached to the state’s anti-cultism unit, and the public outcry that followed, was one police killing too many and a rude awakening to the Nigeria Police Force (NPF) to rein in its personnel from citizens’ extortion and killing before the nation descends into a state of anarchy. 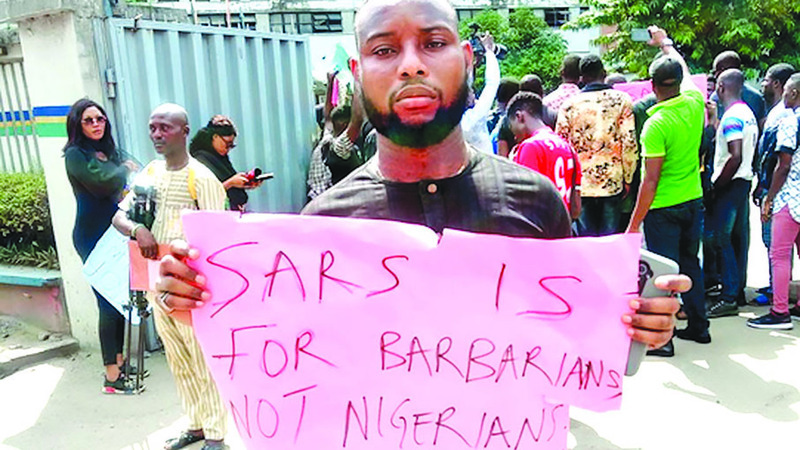 Ahead of a coordinated #EndSARS protest holding today in three cities – Fela Shrine, Agidingbi (Lagos), J-Allen Junction (Ibadan) and Police Force Headquarters (Abuja) by concerned Nigerians, and after a test show yesterday at police headquarters in Obalende, the Lagos police command yesterday announced the dismissal of the officer that shot Kolade from the force. According to the state police spokesman, Bala Elkana, the judgment was served in an orderly room trial by the police and found Inspector Ogunyemi Olalekan guilty of “discreditable conduct by acting in a manner prejudicial to discipline and unbecoming of members of the force by shooting and killing Kolade Johnson; unlawful and unnecessary exercise of authority by using unnecessary violence, using AK 47 rifle on the deceased in total neglect to the provisions of Force Order 237 on the use of Firearms. “There was no evidence linking the second defaulter, Sergeant Godwin Orji, to the shooting. He was therefore found not guilty and discharged and acquitted. Inspector Olalekan is hereby handed over to the Criminal Investigation Department, Panti for prosecution in conventional court,” Elkana said. Two weeks earlier, Inspector Ogunyemi Olalekan, alias ‘Omo Eko’ had been exposed on the social media for alleged extortion and harassment around Gbagada area of Lagos. He was identified as the same officer, whose picture was posted on Twitter by Oluwasegun Haziz on March 22, with a young man prostrating before him. In the post, Haziz appealed to the Complaint Response Unit (CRU), headed by Abayomi Shogunle, an Assistant Commissioner of Police (ACP), to caution the inspector for alleged illegal activities, which he witnessed following the arrest of his colleague at Queens Street, Sabo, Yaba. He alleged that his colleague and others were dragged down from a commercial bus while they were returning from lunch, because of their hairstyles, and taken to a corner at Gbagada Police Station, where they were asked to each bring N50,000. Haziz, who alleged that he paid N5,000 for his colleague’s release after calling someone, who intervened, added that he witnessed another victim pay N50,000 because nobody pleaded on his behalf. The series of tweets were also accompanied with a photograph of a half-clad young man with ‘funny hairstyle,’ prostrating on dirt-strewn ground before the burly figure in mufti. Nigerians on social media slammed the police, especially the CRU, for not taking action when the officer was reported two weeks ago. They lamented that if the inspector had been investigated, Kolade’s death might have been prevented. The police spokesman in Lagos, Bala Elkana, has expectedly come under attack for his comment that tattoo and dreadlocks are strange to Nigeria’s culture. Elkana had in an interview with BBC Pidgin, said it was part of the reason why most people who rocked them were being harassed by law enforcement agents. Bala, who condemned the killing Kolade, said police officers usually harass any youth wearing dreadlocks or having a tattoo on them because most of the cultists who had been arrested wear dreadlocks or had tattoos on them, adding that the police had overtime seen a connection between cultism and those who rocked dreadlocks and had tattoos on their body. But in reaction, founder of the Free Nation movement, Daddy Freeze and Nollywood actress, Omotola Jalade-Ekeinde, have attacked Elkana for the comment. Reacting to this development, Freeze, on his Instagram page, said Elkana’s statement reeked prejudice and stereotyping. “By the way, my Yoruba grandmother had tattoos, there were local tattoos that women wore back then, my grandma had them. Kids born with dread are called ‘dada’ so I’m not getting this,” he said. Also, Jalade-Ekeinde said the police needed to undergo mental evaluation, saying that they needed to be exposed, retrained and re-educated. “These people need to truly undergo mental evaluation. Are suits part of your culture? Why haven’t you arrested politicians and professionals that wear them? If he really said this, it’s truly embarrassing the quality of minds in positions of authority in this country. So sad,” she said. Security experts have also joined in the public outcry of police injustices. 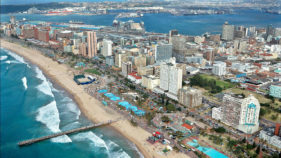 The CEO of Bulwark Intelligence Company and security expert, Tanwa Ashiru, noted that it is a very troubling situation. “Across the world, tensions often exist between the police and the policed, that is why building relationships within the community is very important. Incidents like this are a setback for community policing. If local communities start seeing the police as adversaries, they will not be willing to lend their support. “The police have a lot of work to do in regaining the trust of the Nigerian people. They must start seeing themselves as problem solvers not just crime fighters. The leadership must show a zero tolerance to police brutality and killing of unarmed citizens by their personnel. The increasing reports of police killings across Nigeria is also a major cause of concern. It is indicative of recent trends, which show an increase in small arms and light weapons across the country, as well as an increase in disregard for constituted authority,” she said. According to security analyst, Mr. Christopher Oji, “the killings are becoming too many. It is quite a pathetic situation we found ourselves in the hands of trigger-happy policemen. The killing of Kolade shows that the police have not learnt their lessons and are not ready to repent. “Two weeks ago, a school girl was sent to her early grave by a trigger-happy policeman at the Agbowa area of Ikorodu. The police high command claimed the policeman was undergoing internal disciplinary action. Last year, a young boy was sent to his early grave at the Olodi Apapa area of Lagos. The police said disciplinary action was also being taken. “These guys should be given tutorial before they give them arms. They should be reminded on when a policeman is allowed to use his forearms. I trace the killings of innocent people by the police to drunkenness. If you see them going for operations, they drink all sorts of drugs and drinks. I think the team leader should also be held responsible for the sin of their juniors”. The month of March 2019 had recorded the most number of reported killings by the police in the country in recent times. It began on March 2 with some trigger-happy police officers shooting a bus driver dead in Mosan, Ayobo area of Lagos for refusing to part with money. Two weeks after, a teenage girl was killed by a stray bullet in a shootout between policemen and some cultists in Ikorodu, while on March 25, last week Thursday, an Okada rider was shot dead in Kilo, Surulere area of Lagos. The victim, identified as Ademola Moshood, was a few blocks away from his house, when he was shot by an officer attached to Soloki Police Station, Surulere. In what would end an inglorious month for the police, Kolade Johnson was murdered on Sunday, March 31.